I was writing an article about the apostle Peter today for another website. I like Peter. Sometimes people aren’t very nice to him because they focus too much on the mistakes he made, but he did more right than wrong. Peter was the first apostle Jesus chose. He had so many people to choose from, but he chose Peter first. Right away, that tells you something about Peter. Peter was the first to offer some important testimonies that Jesus was the Christ, even at the times when other people didn’t seem to understand who He was. Peter tried to defend Jesus against the people who came to arrest Him by cutting off the ear of one of them. Jesus made him stop and told him not to interfere because this had to be done, but either way, we could see how much Peter loved him and how prepared he was to risk his life for the Savior. It’s pretty risky to attack someone when you’re surrounded by soldiers. When Jesus was gone, Peter was in charge. He’d only been a member of the Church for three years, and he was in charge of the whole thing. That must have been scary. Jesus had been different—not just an ordinary church president. There wasn’t an exact model for Peter to follow. Most people still didn’t understand the gospel very well and all the procedures weren’t in place—things changed from time to time. It was up to Peter to keep the little church running, spread it around the world, and settle all the arguments and try to fix the apostasies. He performed miracles and raised Tabitha from the dead. That is a great bio for any leader. Still, too many articles about Peter don’t focus on those things. They focus on the mistakes: Peter lost faith while trying to walk on water and fell in. Peter denied Jesus three times. A lot of times we forget to notice what Peter did after he made a mistake–and what Jesus did. We don’t know exactly what Peter thought about each of those times; we do know Jesus forgave him and told him that he, Peter, would be in charge of the church when Jesus died. Even though Jesus knew Peter would make mistakes, even knew the denials would happen, he didn’t take away Peter’s chosen destiny. Peter repented. We read that after the denials, he went off and cried. We can be sure he repented during that time and did whatever he had to do to get back on track. And then what? Did he sit around feeling sorry for himself, deciding God would never love Him again, feeling he could never change? No, after he repented, he started over. When Jesus was gone, he called a meeting and got a new apostle called to replace Judas. He went out and did missionary work. He made executive decisions concerning how the church would run. He opened himself to revelation from God. He moved on. 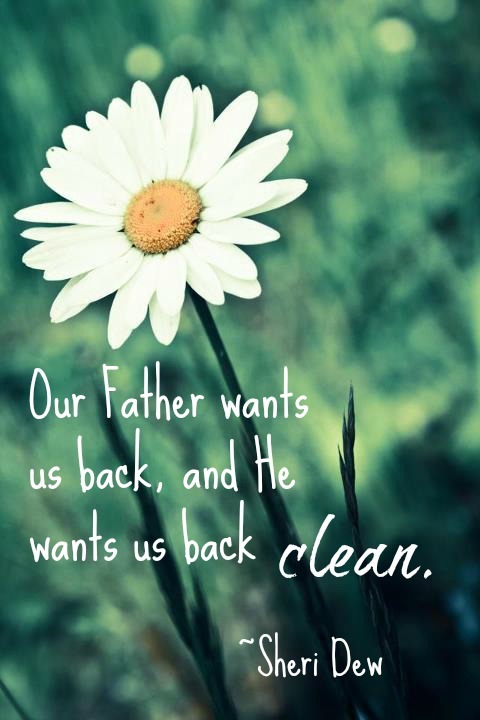 God forgives us completely when we repent. We have a responsibility to forgive ourselves too. Otherwise, we’ll never be able to get God’s work done. The next time you make a mistake, repent and move on.